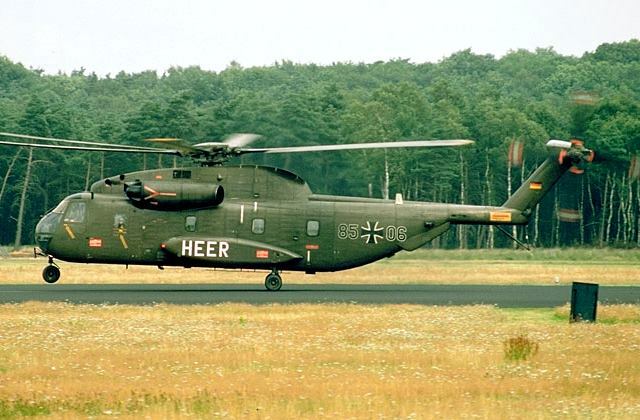 The Heeresflieger is the Army Aviation Corps to the West German Army operating its fleet of rotary wing helicopters. The Army Aviation Corps was founded with the establishment of the West German Bundeswehr in 1955. 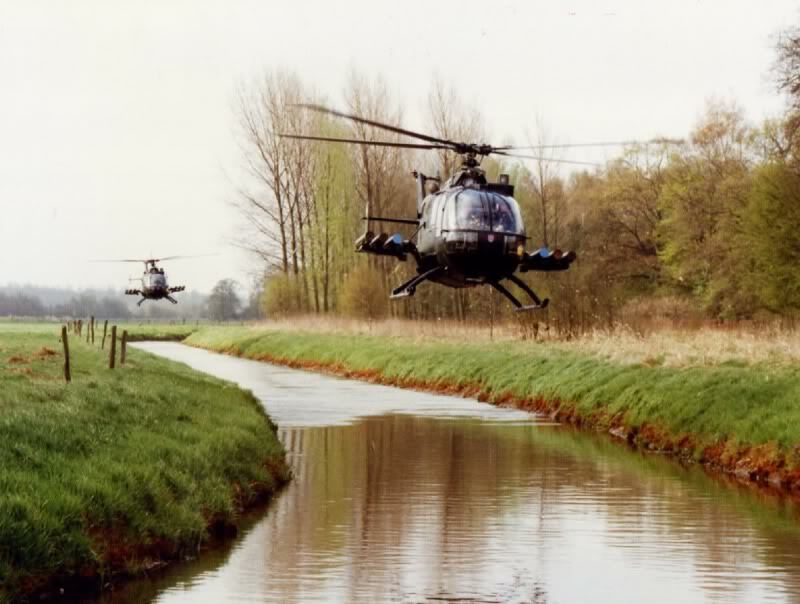 The main tasks of the Heeresflieger is to conduct anti tank warfare in support of ground forces, transportation of personnel and materiel, conduct reconnaisance in coordination with other forces, conduct liaison and provide humanitarian & disaster relief via vertical replenishment. The Heeresflieger's motto is "Nach vorn" which translates into 'To the Front or Forward' which held true during the Cold War, with Heeresflieger Bo-105 anti-tank helicopters using their speed and nimble agility to operate forward of the main elements of the West German Army and locating Warsaw Pact ground forces to engage their armored forces in close combat. The uniform displayed here is the Grundform (Basic Uniform) for a Oberstleutnant (Lieutenant Colonel) in the Heeresflieger. The uniform jacket is the standard grey color of the Heer (West German Army) with the silver-gray colored piping denotes the wearer's affiliation to the aviation branch. The pants are the standard black trousers worn by all West German Army personnel. The visor cap is of the Cold War era having now since reunification been replaced by a maroon beret bearing the metal cap insignia of the Heeresflieger depicting a wing, crossed vertically by a sword, surrounded by oak leaves and the silver oak leaves of a commissioned officer in silver on the visor itself. The visor cap here is shown bearing the crossed sabers and oak leaves insignia of the Heer and the insignia of the Federal Republic of Germany (West Germany) represented by the national colors red, gold and black in a round emblem. Note the shoulder boards with the silver-grey Heeresflieger branch piping and the rank insignia of a Oberstleutnant with two silver pips and crossed laurel wreaths. The bearer for this uniform also wears the a Commander's Cord signifying being a commanding officer of a field grade uniform probably of Battalion strength, the uniform also has the Bundeswehr Militärluftfahrzeugführer (Military Aviator) badge in Gold grade. 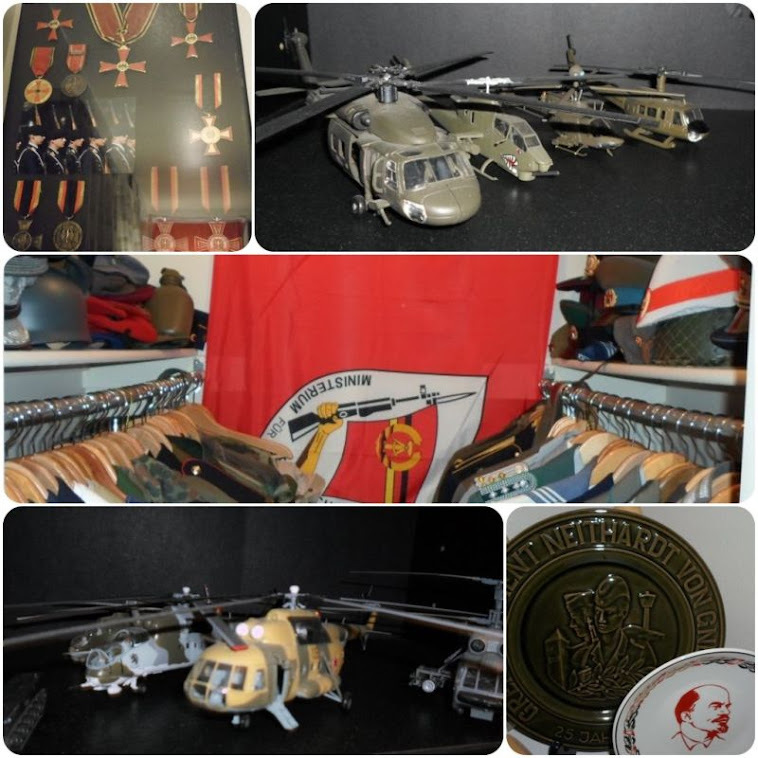 His awards include the Bundesverdienstkreuz 2 Klasse (Federal Merit Cross 2nd Class), Ehrenkreuz der Bundeswehr in Gold (Honor Cross of the Armed Forces in Gold) and Deutsches Sportabzeichen (German Sports Badge). His Honor Cross denotes that he served 20 years of honorable service in the West German armed forces. The cuff bands bear the insignia of the Army Aviation Corps depicting flying wings symbolizing the task of the aviation branch. 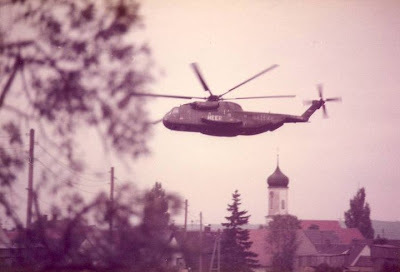 The Heeresflieger operated a number of rotary wing helicopters throughout the Cold War most notably the Bell UH-1D Iroquois helicopter in the light utility role, the Sikorsky CH-53D Super Stallion helicopter in the heavy lift transport role and the Messerschmitt Bolkow-Blöhm B0-105P helicopter in both the reconnaisance, close air supprt and anti-tank roles.